Breaking Ground on Wingohocking St.! Yesterday we celebrated the launch of the Building Our Future Together partnership’s second renovation in Philadelphia with a groundbreaking ceremony, block party, and volunteer event! The next Building Our Future Together project in Philadelphia is on Wingohocking Street in the Nicetown section of North Philly, only blocks from the LEED Platinum house on Greene St. that was completed in August. The abandoned property consists of two conjoined rowhomes and is tucked behind the major Nicetown Court development, currently in construction, on Germantown Avenue. Click here for more photos and information about other redevelopment efforts in Nicetown. 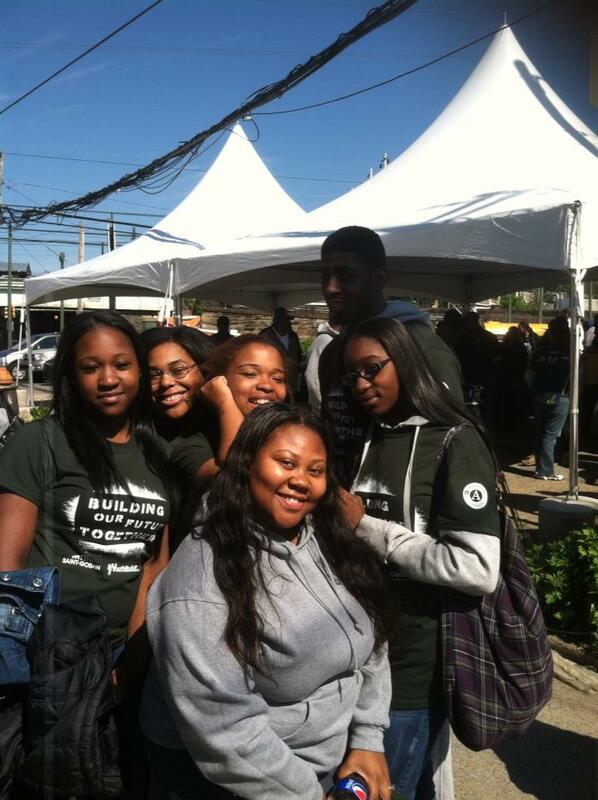 YouthBuild Philly students and staff joined representatives from YouthBuild USA, Nicetown CDC, Saint-Gobain, CertainTeed, and the City of Philadelphia to celebrate the kickoff of this new green-building effort. 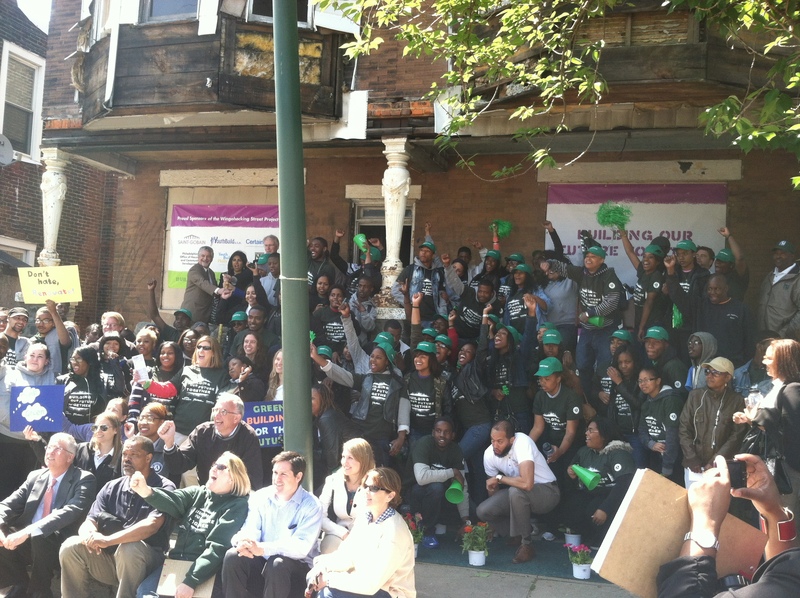 After remarks by YouthBuild founder and CEO Dorothy Stoneman, Saint-Gobain President and CEO John Crowe and Deputy Mayor Alan Greenberger, everyone participated in a pep rally to celebrate the “Green Team” of YouthBuild students whose vocational training has emphasized sustainable building practices. On behalf of YouthBuild’s Class of 2013 and the Green Build team, I want to thank everyone for being here to show their support. I also want to thank the project sponsors, YouthBuild USA, Saint Gobain and CertainTeed, for teaming up with YouthBuild Philly again on a second renovation project. What I like most about being at YouthBuild is feeling like I am a part of something important. Everyone wants to feel connected to other people and to do something meaningful. Being on the Green Team, and building a house for someone, is a perfect example of how YouthBuild helps me feel like I am part of a community and that I can make a difference. 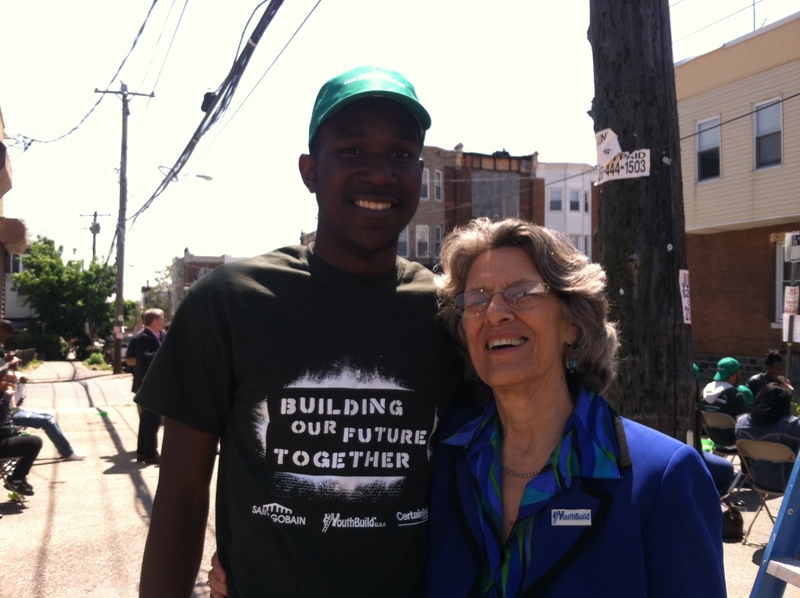 Building homes has also taught me about excellence, which is one of YouthBuild’s core values. When you are building a home where someone’s going to be living, you want everything to be on point. 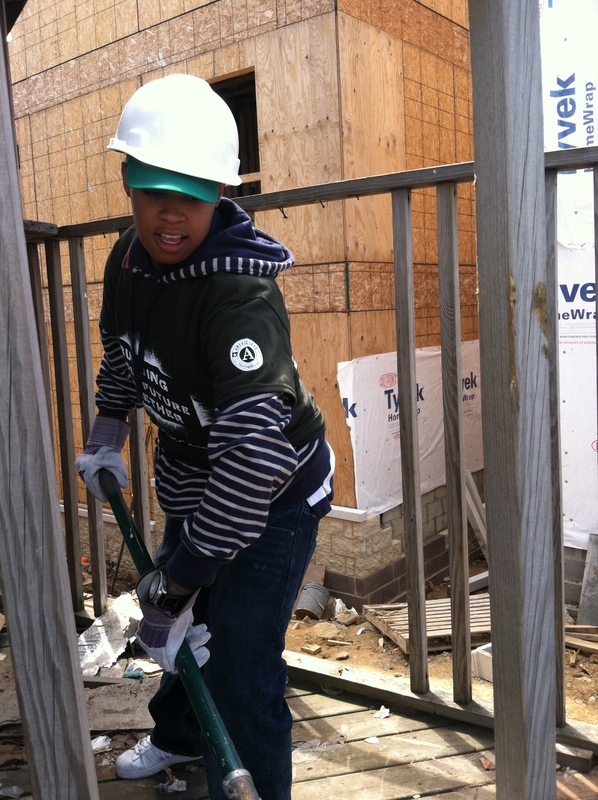 Additionally, Saint-Gobain and YouthBuild USA help us build excellent homes. On the Green Team, I’ve learned about how technology and green-building can help homeowners save money and reduce their environmental impact. A green home benefits the homeowner, and the whole world. Knowing that my classmates and I have the skills to take a house that looks like this and turn it into a real home for a family who needs it, makes me feel good about myself. It makes me feel good about my work and about what I can accomplish. It’s made me realize that I’m capable of things I never knew I could do. This year, I am starting to understand what people mean when they talk about my potential. I am starting to get a picture in my head of everything that I can be. 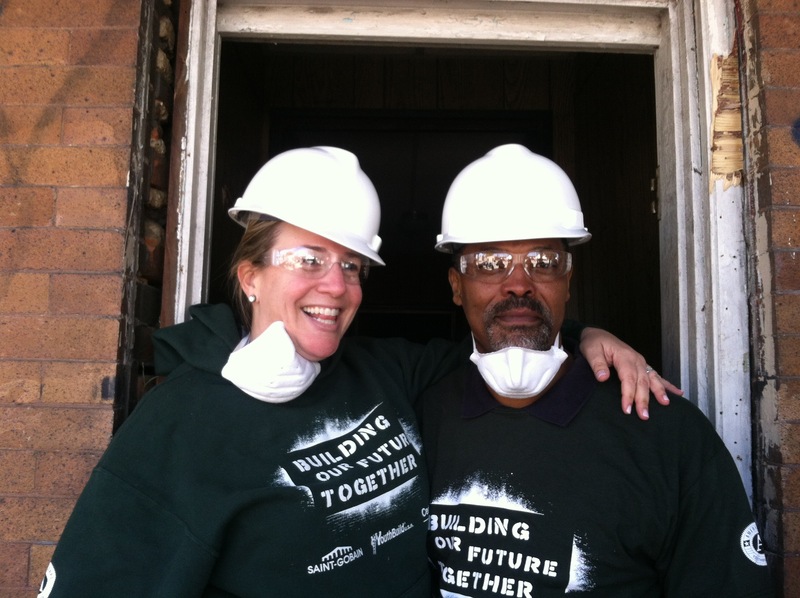 What’s great about being on the Green Team is that we not only have personal support from YouthBuild, but we also have that support from Saint-Gobain. Earlier this year Saint-Gobain invited the Green Team to visit their offices in Valley Forge, and their employees shared career and life advice with us. I want to thank them again for that. I was inspired by their stories, and felt excited for my future after that conversation. 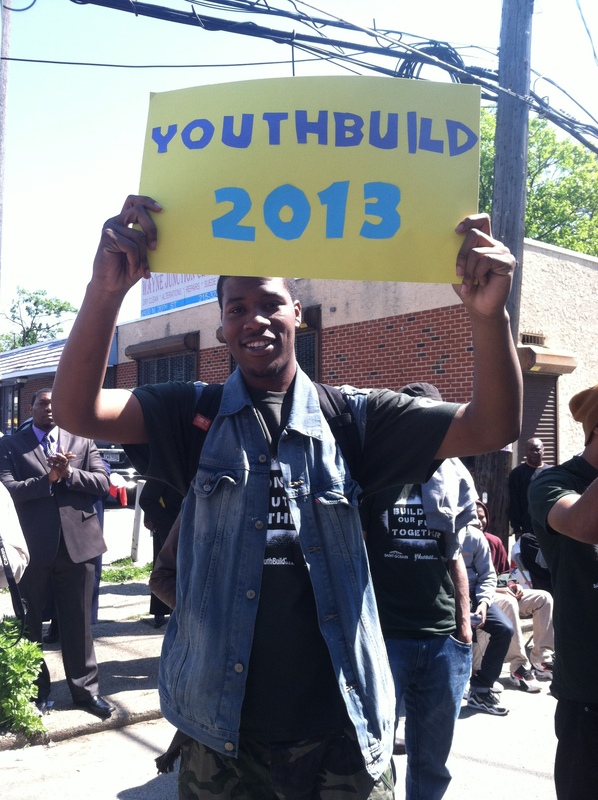 This summer, I will be starting a welding apprenticeship and graduating from YouthBuild Philadelphia. My plan is to keep working in the building trades, and to continue my education so that I can build on my success this year. Thank you to everyone who has made this possible, and thank you all for being here today to celebrate with us. After the remarks and pep rally came the moment we had all been waiting for – the ground-breaking! 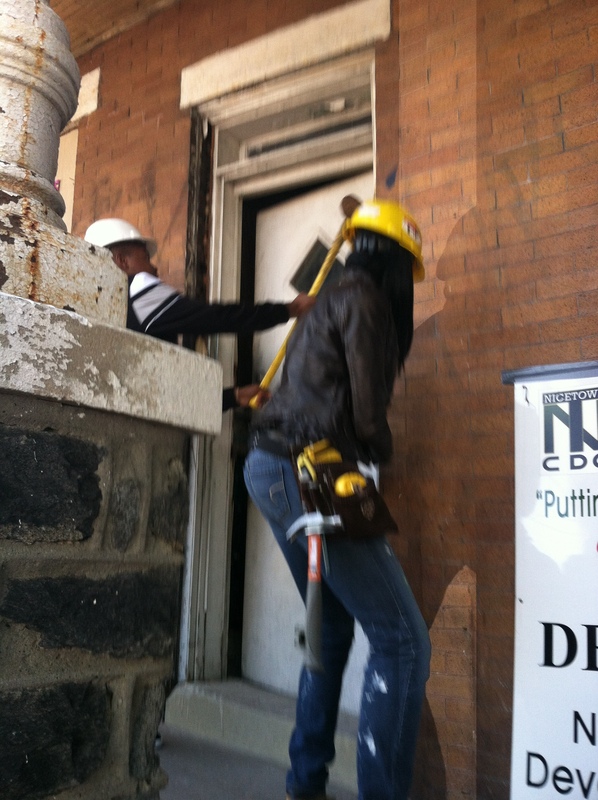 Green Team students Imir Felton and Yolandias Moody handily swung their sledgehammers against the door of the property to signify the official start of the renovation effort. Before the work began, however, everyone took a lunch break and danced to the live DJ’s music. In the afternoon, volunteers from YouthBuild USA, Saint-Gobain and CertainTeed, and the YouthBuild Philly Board of Trustees joined building trade students in working on the houses. The first step was clearing the homes of debris (of which there was plenty) to create a workspace suitable for the gutting and rebuilding efforts to come. It’s a dusty job, but somebody’s got to do it – and our volunteers are awesome for being so excited to be that someone! We’d like to give a big YouthBuild Philly shout-out to everyone making this project possible, and those who came out yesterday to celebrate our students and the start of this house’s journey. Stay tuned for updates on this project! We celebrated the launch of a new LEED-targed green rehabilitation project with a ground-breaking ceremony on Wingohocking Street in Nicetown.